more of these in different colors. Let's try something new!!! I have put some quilt tops together and will be adding more. these are just the tops. You purchase and add your own batting and backing, and finish with machine or hand stitching, or just tie them down. These are serge seam quilt tops and I only have what you see. These are great for prayer quilts, birthday gifts, or just to use yourself. They are different sizes and I will list the size below the quilt top. I am in the process of cleaning out my stash and am making some to donate to the centers that help the homeless. 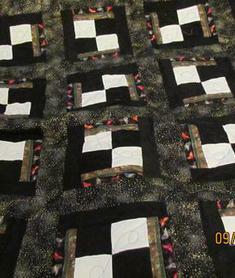 We can only do this if we have money to back the quilts, and that is why I am selling some of them. If you would like a top finished I will finish the ones shown for an added $30. Many hours to into designing these quilts and putting them together. 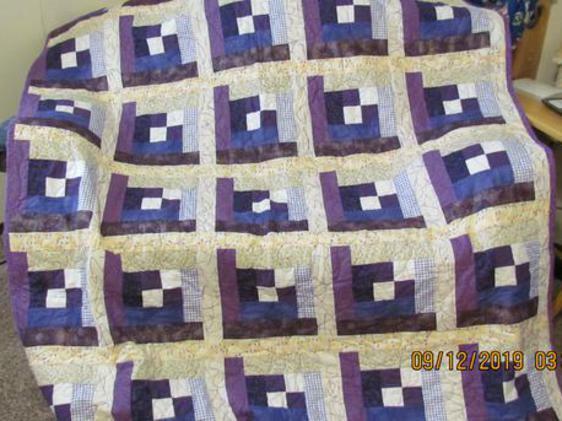 Anyone that does quilting will know this is a real buy. Just let me know. We will be adding more in the weeks to come. Thank you for your interest and help. If you are interested in either of these designs in a specific color please feel free to contact us and we will be glad to try and add that color. This is the "Walk through the garden" in brown, beige and burgundy. It measures 57"x67" with the border, and sells for $30 unfinished. Below is a close-up. We call this quilt top "Working on a building"
This one is in burgundy and beige. It is made from 2 1/2" squares of various Burgundy and unbleached muslin. There is no border on this and it measures. 60"x60" This quilt top blossomed in my mind for many months before it toke shape on paper and then in fabric. It sells for $35 and with the addition on your borders you can make this fit a full size bed easy. This quilt is sold.